Like An die Sonne, another Uz setting for SATB, this is a fine setting in Schubert’s antique style where the shades of Handel and C P E Bach conjoin with that of Haydn, himself influenced by those older masters. As the date is uncertain, Deutsch consigned it to the outward region of his catalogue – the late 900s where the problematic works are to be found. That someone as experienced as Deutsch could come to no conclusion about the dating of this music shows that Schubert in this mood gives us almost no clues or thumbprints typical of his song-composing style. Despite the work’s grandeur and skill, it has a certain anonymity. It is possible that Schubert wrote this work in 1828, towards the end of his life when he got to know Handel’s oratorios at first hand thanks to Anton Schindler who allowed him to borrow the scores that had belonged to Beethoven. This was also when Schubert decided to resume his counterpoint studies, this time with the celebrated teacher Simon Sechter. (He only had one such lesson before he died.) This music was published soon after the composer’s death. Both Leopold Sonnleithner and Schubert’s brother Ferdinand orchestrated the piano accompaniment. If this is anything to go by, there was an appetite in Vienna for religious music of this kind at the time of Schubert’s death. Franz Lachner orchestrated Mirjams Siegesgesang. Perhaps this reinforces the argument for dating Gott im Ungewitter as late as 1828. However, the case for 1816 as the date for this work and its pendant, Gott der Weltschöpfer is equally, if not more, strong. 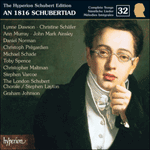 At this time Schubert was still in touch with his old teacher, Antonio Salieri, and these songs might be thought to stem from the contrapuntal exercises undertaken during these earlier studies. 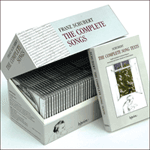 Even more significant is the fact that 1816 was the year of all the other Uz settings, including An die Sonne and the five solo songs such as Gott im Frühlinge and Der gute Hirt, companion poems to the two lyrics set here as grand choruses. In all these poems, Uz looks to the natural world, and the weather, for evidence of God’s ubiquity. There could scarcely be a word in the German language which more suggests dotted rhythm, when spoken, than ‘Schrecklicher’. It is the shudder inherent in this word that pervades the first section of this song marked ‘Allegro moderato’. The key of C minor seems the obvious choice for religious music with an element of divine vengeance. After the invocation (the bass sings ‘Du Schrecklicher’ as a solo, and is twice echoed by his colleagues) the music moves to-and-for between the staves in ever-inventive interchange and imitation. The question ‘Wer?’ is tossed between the top and bottom pairs of voices. ‘Gross ist der Herr, was trotzen wir?’ initiates a fugato which lasts only eight bars, but which displays a working knowledge of fugal technique; it moves convincingly between alternating subject and counter-subject in ascending order up the four staves, from bass to soprano. The peremptory setting of ‘Er winkt’ is appropriately gestural, and at ‘und wir vergeh’n’ the bass line swoons in the bottom regions as if giddy and overawed. At ‘Er lagert sich in schwarzer Nacht’ there is a switch to the later musical language of Sturm und Drang. The piano writing – rumbling octave basses – suddenly looks like Beethoven on the page, an illustrative response to the image of shivering (‘Die Völker zittern schon’). There is more contrapuntal interchange and imitation at ‘Geflügeltes Verderben wacht Um seinen furchtbarn Thron’, as pompous and self-important as an indictment at a trial where a potentate’s punishment is a foregone conclusion. This repetitive section moves without pause into a moto perpetuo of storm music. This takes its musical direction from the thunder-and-lightning words ‘Blitz aus finstrer Höh’’ and ‘Donner stürtzt sich auf das Land’, as well as the image of ‘Die zitternde Natur’. An onslaught of concerted voices sweeps aside layered part-writing, and banishes all pretence at old-fashioned counterpoint. The look of the incessant dotted rhythms on the page is similar to that of the horse-ride battle music of Normans Gesang. This music of the Last Judgement brings to mind the Klopstock setting by C P E Bach on the same subject – Der Tag des Weltgerichts – which is also based on a moto perpetuo of jangling dotted rhythms. The section ends in B flat major – a six-bar postlude fades away, diminuendo, as it moves through different harmonies on a B flat pedal and returns to a hushed B flat major. The younger Bach and Klopstock were content to leave the world quaking before the terror of divine reprisal. But Uz provides a consolatory let-out clause for the righteous, and Schubert sets this as a benign Andante con moto in E flat major. The wrath of God is tempered by his mercy, and the relative major shows the other side of his character. The music still remains rather simple and old-fashioned, as is often the case with this composer when he portrays the devout, but occasionally an inimitably Schubertian touch emerges in the details: he cannot, for example resist dry quavers separated by rests ‘pflückt wie dürres Laub’. Otherwise this music is remarkable for its seamless legato, in line with the text’s insistence that God is gentle and patient, despite seeming to be angry. The word ‘zornig’ occasions off-beat emphasis in an otherwise smooth texture; the elongation of the word ‘grosse’ – emphasizing that God is a great friend of mankind – is a dramatic moment in music that otherwise seems almost cosily complacent in its affirmation of faith. Wer kann vor dir und deinem Donner steh’n? Gross ist der Herr, was trotzen wir? Er winkt, und wir vergeh’n. Und in der Tiefe lebt. Und weit umher die Flur. who can stand before you and your thunder? Great is the Lord; why do we defy him? will not spare me in his mercy? even when he seems angry. the mighty friend of mankind.